AutoNation Inc. is launching a $20 million advertising campaign, its biggest ever, tied to an upcoming milestone: its 10 millionth vehicle sold. The campaign, which began last week, includes AutoNation's first-ever national TV advertising, with spots on ABC's IndyCar racing coverage and CNBC's "Squawk Box," plus print, digital and radio components. It also features car giveaways and a sweepstakes to win a trip and the chance to draw for a $10 million prize. IndyCar racer Ryan Hunter-Reay, sponsored by AutoNation, is featured prominently in the campaign. 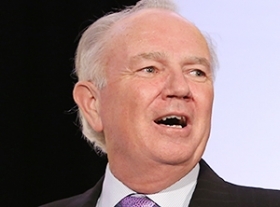 "It's an exciting time for our company," AutoNation CEO Mike Jackson wrote in a note to employees last week. "We're launching the two largest sales promotions in our history." The first part of the campaign, dubbed the "Race to 10 Million," runs through May. Advertisements urge customers to come in for "record-breaking savings." The company expects to sell its 10 millionth vehicle about June 1 or 2. Jackson plans to announce the milestone on "Squawk Box" on June 3. The company will celebrate by giving away three vehicles, one each in its south Florida, Dallas and Los Angeles markets. Then the second half of the campaign, dubbed "Thanks-a-$10-Million," will be launched and run through July 6. Advertisements will tout "thank-you pricing" and urge people to sign up in stores or online for a sweepstakes that could win them $10 million. The sweepstakes winner will get a trip to the Aug. 30 GoPro Grand Prix race in Sonoma, Calif. At the race, the winner will get a chance to draw an envelope to win $10 million. The winner has a one-in-100 chance to win the $10 million, which would be paid out under an insurance policy taken out by AutoNation, a company spokesman said. If the person doesn't get the $10 million, he or she will get to choose a $25,000 prize or a new Honda Accord. AutoNation employees also will have the chance to win prizes, including trips to the GoPro race.